FRANKFURT MUSIKMESSE 2010: Europe's biggest music-making equipment trade show has kicked off with a bang - or should that be a bleep, a squelch, a crunch, a strum and possibly even the occasional parp? Yes, in the best Musikmesse tradition, the halls are decked with new gear: synths, guitars, software, amps, interfaces and everything in between. 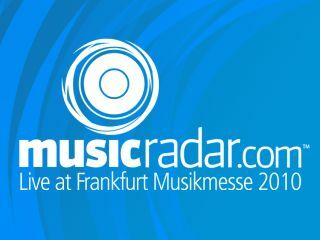 MusicRadar is not just surviving the chaos, but thriving amid it, scoping the show floor to bring you all the big news, videos of the hottest gear and photos of random loveliness. As Aerosmith once almost said, you won't want to miss a thing, and if you bookmark our Frankfurt Musikmesse Ultimate Guide and follow us on Twitter and Facebook you won't have to. A triple-stacked virtual analogue engine, anyone? Are these the class leaders their maker claims? Vintage sound from a practice amp?